Valentine’s Day in South Africa is on Friday, 14 February 2020. This is the perfect opportunity to express your love and add a little romance to your relationship by sending your love in Durban a beautiful bouquet of roses, a unique flower arrangement or a delightful hamper or gift. Our Valentine’s Day Flowers in Durban are handcrafted by our very own florist, so you can expect the best quality flowers and service from us... and if flowers won’t melt her heart, send her a lovely Valentine’s Day gift or chocolate hamper. Please note: This website is for Durban deliveries only. If you’d like to send Valentines Day flowers, hampers or gifts anywhere else in South Africa for, please order from our national website. If you are looking for creative ideas for Valentine’s Day or advice on ordering flowers and gifts around this busy time, take a look at these Valentines Day gift ideas and our guide to buying flowers for Valentine’s Day. We are able to deliver flowers on Valentine’s Day in Durban. Please note however that due to the increased demand for fresh flowers around this time, flower orders should be placed as early as possible (ideally no later than the 10th) to ensure delivery on or before Valentine’s Day. 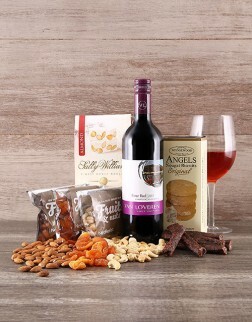 Valentine’s Day gifts and hampers need to be couriered and must be ordered no later than 12:00pm on Wednesday, 12 February for delivery on Friday, 14 February. To avoid disappointment, please place your orders as soon as possible. Gifts and hampers cannot be delivered on weekends. For flowers, hampers and gifts to all other areas in South Africa, please order from our Valentines Day range on our national website. I ordered the Hatbox with exclusive choccies for my husband on our 26th anniversary (because I was away at the time) - what a pleasant surprise to have really got what one ordered. The most delicious chocolates were in the hamper and the packaging was beautiful too. Oh and by the way I ordered it (online) the previous evening around 20h00 and he received it the very next morning, ONTIME for our anniversary. How great is that! !